Background: Because of the improvements in survival rates, patients with breast cancer are now more likely to die from cardiovascular disease than from cancer. Thus, providing appropriate preventive cardiovascular care to patients with cancer is of the utmost importance. 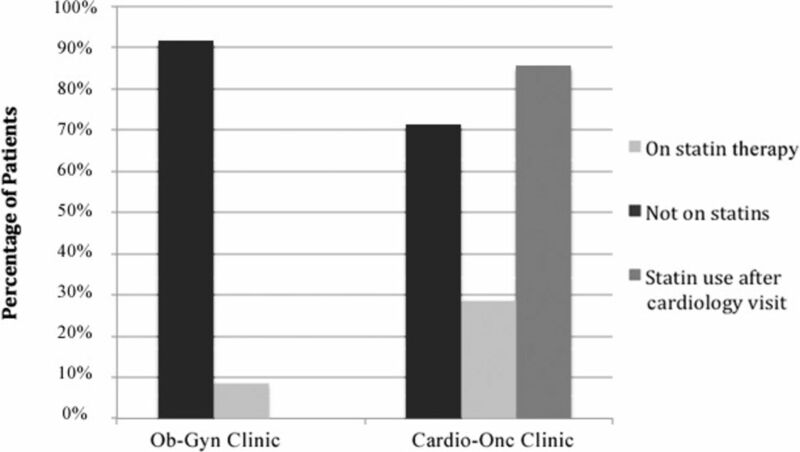 Methods: We retrospectively compared the cardiovascular risk and management of 146 women treated at the Cardio-Oncology (Cardio-Onc) and the Obstetrics and Gynecology (Ob-Gyn) clinics. We calculated cardiovascular risk using the American College of Cardiology (ACC)/American Heart Association (AHA) atherosclerotic cardiovascular disease (ASCVD) risk calculator and the Framingham Risk Score Calculator. We also determined the prevalence of appropriate statin use according to both the 2013 ACC/AHA and the 2002 Adult Treatment Panel (ATP) III lipid guidelines. Results: The 10-year ASCVD risk score was not significantly different between the 2 cohorts. More patients in the Ob-Gyn cohort with an ASCVD risk score >7.5% were already appropriately on statins compared to patients in the Cardio-Onc cohort (60.9% vs 31.0%, respectively, P=0.003), but after the first Cardio-Onc visit, 4 additional patients with breast cancer were prescribed statins (44.8% total). Fourteen (19.2%) Cardio-Onc patients had a high Framingham Risk Score compared to 6 (8.2%) Ob-Gyn patients. Conclusion: We demonstrated that the ASCVD risk is similar between women with breast cancer attending the Cardio-Onc clinic and the women without breast cancer attending the Ob-Gyn clinic, but the Cardio-Onc cohort had significantly more patients with a high Framingham Risk Score. Both clinics had similarly poor rates of appropriate statin prescribing rates according to the ATP III guidelines. Breast cancer is the leading type of cancer among women in the United States, with an incidence of 232,670 in 2014.1 During the past few decades, with improvements in cancer diagnosis and treatments, cancer survivorship and survivor life expectancy have improved to the point that most survivors now die from cardiovascular disease.2 The prevalence of cardiovascular disease among breast cancer survivors is not only attributable to traditional cardiovascular risk factors such as hypertension, diabetes mellitus, tobacco use, and hyperlipidemia but also to potential cardiotoxic agents used for breast cancer treatment. Chemotherapies such as HER2 receptor inhibitors (ie, trastuzumab) and anthracyclines increase the risk of cardiomyopathy in the short and long term, respectively.3 Cardiotoxicity may be present as early as within the first year, and some of its negative effects can linger for longer than 20 years.4 Cardinale et al found that the incidence of anthracycline-induced cardiotoxicity was approximately 9%.5 In addition, 15,000 childhood cancer survivors who were treated with anthracyclines had a heart failure cumulative incidence of 3.2% by age 40.6 Anthracycline-induced cardiomyopathies have a much worse prognosis compared to other forms of cardiomyopathy, with a 2-year mortality rate of up to 60%.7 Thus, early detection and treatment of cardiotoxicity are of utmost importance. In a 2010 study by Cardinale et al, recovery of cardiac function occurred in only 42% of patients who were started on appropriate medical therapy and only when therapy was initiated within the first 6 months following anthracycline exposure.8 Furthermore, chest radiation therapy, a common treatment for breast cancer, is known to increase the long-term risk of atherosclerosis and coronary artery disease.9-11 Therefore, appropriate screening and treatment of cardiovascular disease and its risk factors early in the course of breast cancer treatment and throughout the cancer survivor's lifetime are likely warranted. In 2013, the American College of Cardiology (ACC) and American Heart Association (AHA) updated the guidelines for assessing atherosclerotic cardiovascular disease (ASCVD) risk in adults for a 10-year period.12 The previous guidelines published in 2002, Adult Treatment Panel (ATP) III,13 used the Framingham Risk Score to calculate cardiovascular risk. These guidelines were established to determine which individuals might benefit from initiating lipid-lowering therapy in the form of a statin medication. We were interested in identifying the cardiovascular risk of women with breast cancer in our Cardio-Oncology clinic (Cardio-Onc) by using these 2 methods. The Cardio-Onc clinic was established to deliver a multidisciplinary approach between cardiologists and oncologists to provide an initial assessment of a patient's risk of developing cardiotoxicity, to monitor for any early signs or symptoms of cardiotoxicity, and to initiate early treatment of cardiovascular disease side effects from cancer treatment.14-15 By calculating the 10-year ASCVD risk score and the Framingham Risk Score among women diagnosed with breast cancer attending the Cardio-Onc clinic and comparing their scores to those of a group of women without breast cancer attending the Obstetrics and Gynecology (Ob-Gyn) clinic, we hoped to determine if the Cardio-Onc group had a higher baseline cardiovascular risk and if the patients were being appropriately treated with statins based on the 2013 ACC/AHA lipid guidelines or the 2002 ATP III guidelines. To our knowledge, no research has been published to date comparing the 10-year ASCVD and Framingham risk scores of women with breast cancer to the scores of women of similar age without breast cancer. After receiving approval from the Ochsner Institutional Review Board, we conducted a retrospective study at the Ochsner Medical Center, New Orleans, LA. A total of 146 women were included in this study. Seventy-three women were randomly selected from a list of all current female patients of the Cardio-Onc clinic and age matched to 73 randomly selected individuals from the Ob-Gyn clinic from September 2013 to May 2014. 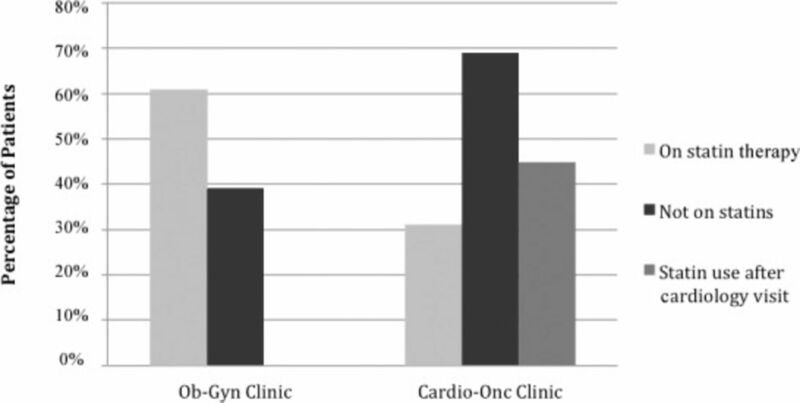 Data were obtained from the patients' first visit to the Cardio-Onc clinic vs any visit to the Ob-Gyn clinic. Women from the case group (Cardio-Onc clinic) were included if they had a diagnosis of breast cancer and had all demographic variables available, including a current lipid profile. These patients represented the spectrum of breast cancer treatment: prechemotherapy, undergoing therapy, and postchemotherapy. The largest proportion was 39 prechemotherapy patients (53.4%). No exclusion criteria applied to the case group. Women from the control group (Ob-Gyn clinic) were included if they had all demographic variables available, including a current lipid profile. Control group patients were excluded if they had any history of cancer. Demographic data collected included race, presence of hypertension (yes/no), hyperlipidemia (yes/no), diabetes mellitus (yes/no), coronary artery disease (yes/no), prior cardiomyopathy (yes/no), current cardiomyopathy (yes/no), tobacco use (never, former, and current), and age (years). These demographic variables were considered present if the patient's physician documented the diagnosis, if the patient was prescribed medications to treat the diagnosis, or if the patient had diagnostic testing that indicated positivity. Systolic blood pressure (mmHg) and diastolic blood pressure (mmHg) measurements were obtained from the initial visit to the Cardio-Onc clinic for the women with breast cancer or from the corresponding Ob-Gyn clinic visit during the same time period for the women who did not have breast cancer. High-density lipoprotein (HDL) (mg/dL), low-density lipoprotein (LDL) (mg/dL), triglycerides (mg/dL), total cholesterol (mg/dL), and use of statin therapy (yes/no) were obtained from the most recent lipid panel within 2 years of the clinic visit. No individual adjudication was performed to further define the presence of cardiovascular risk factors. Using the demographic data, individual 10-year ASCVD risk scores were calculated using the ACC/AHA ASCVD calculator.16 ASCVD risk score was considered low if it was <5%, moderate if it was 5%-7.4%, and high if it was ≥7.5%. According to the 2013 ACC/AHA guidelines, statin prescribing was considered appropriate if individuals had an ASCVD risk score >5%, as the guidelines call for patients with an ASCVD score of 5%-7.4% to be given the option for statins and patients with an ASCVD score ≥7.5% to be strongly recommended to be placed on statins. The Framingham Risk Score, calculated with the formula obtained from D'Agostino et al,17 was considered low if it was <10%, moderate if it was 10%-20%, and high if it was >20%. Statins were considered appropriate if the patients had a high Framingham Risk Score and an LDL >130, a moderate-risk score with an LDL >160, or a low-risk score with an LDL >190. 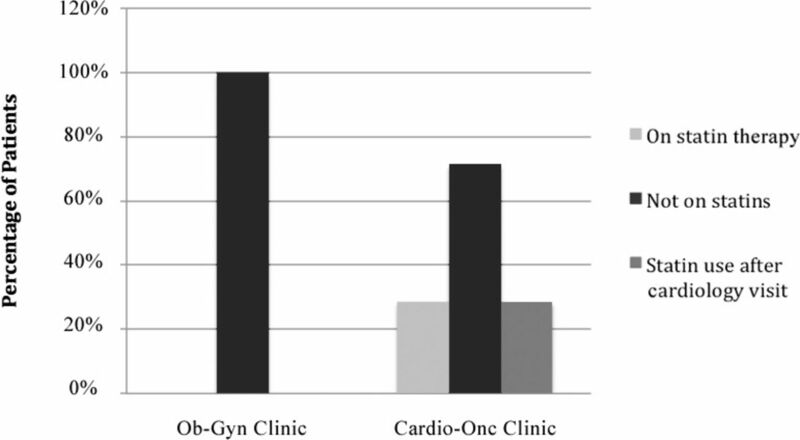 Statistical analyses were conducted to compare women in the Cardio-Onc clinic to those in the Ob-Gyn clinic and assess for significant differences in baseline characteristics, ASCVD risk score, Framingham Risk Score, and lipid treatment between the 2 clinics. Statistical tests included the Pearson chi-square test, the 2-sample t test, and the Wilcoxon Mann-Whitney test. All analyses were completed using SAS v.9.3. Statistical significance was defined as a P value <0.05. Demographic variables for the 2 groups are presented in Table 1. The Ob-Gyn cohort included significantly more white patients than the Cardio-Onc cohort, 65 vs 43 patients (P=0.0001), respectively. Significant differences were also seen between groups for prior cardiomyopathy (0 patients in the Ob-Gyn group vs 8 patients in the Cardio-Onc group, P=0.004) and hypertension (28 patients in the Ob-Gyn group vs 42 patients in the Cardio-Onc group, P=0.02). Mean systolic blood pressure was significantly higher in patients in the Cardio-Onc group compared to the Ob-Gyn group (133.2 mmHg vs 121.6 mmHg, respectively, P=0.002). No other significant differences in demographic variables were seen between groups. The 10-year ASCVD risk scores were not significantly different between the Cardio-Onc and the Ob-Gyn cohorts (Table 1). As shown in Table 2, 29 (39.7%) patients in the Cardio-Onc clinic and 23 (31.5%) patients in the Ob-Gyn clinic (P=0.30) were categorized as high risk (ASCVD score ≥7.5%). Of these high-risk patients, 14 (60.9%) in the Ob-Gyn cohort vs 9 (31.0%) in the Cardio-Onc cohort were appropriately on statins (P=0.03) (Figure 1). Seven (9.6%) patients in the Cardio-Onc clinic and 3 (4.1%) patients in the Ob-Gyn clinic (P=0.19) were categorized as moderate risk (ASCVD score 5%-7.4%). Of these moderate-risk patients, only 2 (28.6%) patients in the Cardio-Onc cohort vs 0 patients in the Ob-Gyn cohort had been appropriately placed on statins (Figure 2). Of the 25 patients in the Cardio-Onc cohort who could be considered for statin therapy (ASCVD score >5% without statin use), only 4 patients were prescribed statins at their initial consultation with the cardiologist, and all 4 patients had a high-risk ASCVD score. Percentages of patients in each treatment group with high atherosclerotic cardiovascular disease risk scores (≥7.5%) who were on statin therapy, not on statins, and placed on statins by a cardiologist. Cardio-Onc, cardiology-oncology; Ob-Gyn, obstetrics and gynecology. Percentages of patients in each treatment group with moderate atherosclerotic cardiovascular disease risk scores (5%-7.4%) who were on statin therapy, not on statins, and placed on statins by a cardiologist. Cardio-Onc, cardiology-oncology; Ob-Gyn, obstetrics and gynecology. The number of patients with a high-risk Framingham Risk Score was significantly different between the 2 groups (Table 3). Fourteen (19.2%) patients in the Cardio-Onc cohort had a Framingham Risk Score >20% compared to 6 (8.2%) patients in the Ob-Gyn cohort (P=0.05). Of the 14 Cardio-Onc patients with a high-risk score, 13 of them should have been on statins because of an LDL >130 mg/dL according to ATP III. However, only 30.8% were on statins, but that percentage improved to 53.9% upon completion of the initial Cardio-Onc consult (Figure 3). In contrast, 50.0% of patients in the Ob-Gyn cohort were appropriately on statins. Percentages of patients in each treatment group with high Framingham Risk Scores (>20%) who were on statin therapy, not on statins, and placed on statins by a cardiologist. Cardio-Onc, cardiology-oncology; Ob-Gyn, obstetrics and gynecology. Among the patients who met the criteria for a moderate Framingham Risk Score, 91.7% of the Ob-Gyn patients and 71.4% of the Cardio-Onc patients were on statins. 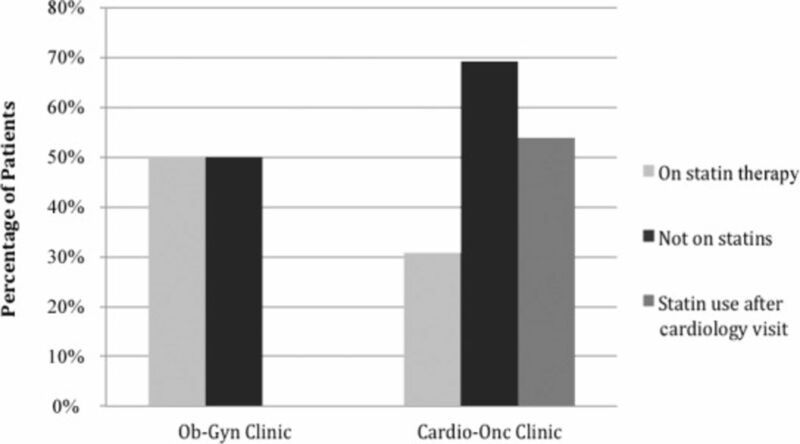 In the Cardio-Onc group, the percentage improved to 85.7% after the Cardio-Onc consult (Figure 4). Percentages of patients in each treatment group with moderate Framingham Risk Scores (10%-20%) who were on statin therapy, not on statins, and placed on statins by a cardiologist. Cardio-Onc, cardiology-oncology; Ob-Gyn, obstetrics and gynecology. In this study, we explored the overall cardiovascular risk score among a small group of women with breast cancer at a Cardio-Onc clinic. In a comparison of the 2 cardiovascular risk calculations, a larger percentage of the population from both groups met the criteria for statin usage according to the ASCVD risk score than did not meet the criteria. We demonstrated that 39.7% of the Cardio-Onc group had a high-risk ASCVD score and therefore should have been on statin therapy. In this group, 20 individuals were not on statin therapy upon presentation to the Cardio-Onc clinic, and only 4 women had statin therapy initiated after the first visit. It is unclear why more aggressive statin initiation was not undertaken but may, in part, be attributable to concerns about starting statin therapy when individuals are beginning or undergoing chemotherapy. This approach, however, may be incorrect as statins may have a role in breast cancer prevention and treatment. Cholesterol, more specifically 27-hydroxycholesterol, is an estrogen receptor ligand and potentially increases the proliferation of estrogen receptor-positive breast cancer cells18 as demonstrated in mouse models.19 Therefore, lowering cholesterol levels or interfering with its conversion to 27-hydroxycholesterol with statins may possibly improve estrogen receptor-positive breast cancer treatment or prevention.19 Additionally, researchers have proposed that statins may directly inhibit cell proliferation; however, this effect is not seen at the statin levels typically present in humans.20,21 Finally, statins may have a synergistic effect on anthracyclines as demonstrated in canines.22 Therefore, statin therapy may have a role in inhibiting cancer progression and improving the ability of anthracyclines to target cancerous cells. Despite these promising findings, no studies thus far demonstrate an improvement in breast cancer cure rates related to statin usage. Statins may have a role in the prevention of cardiomyopathy among individuals with breast cancer treated with anthracyclines. The risk of cardiomyopathy with anthracycline treatment appears to have a 26% prevalence with cumulative doses of 550 mg/m2.23 Currently, treatment protocols minimize the cumulative dose received by individuals with breast cancer to <550 mg/m2. Nonetheless, even at these lower levels, the risk of cardiomyopathy and heart failure can approach 4.3%, and in combination with trastuzumab can increase to 20.1% after 5 years of therapy.24 Statin therapy may have a role in the prevention of anthracycline-induced cardiomyopathy. One study demonstrated that mice treated with fluvastatin plus doxorubicin had a 40% decrease in cardiac output compared to a 67.5% decrease in mice treated with doxorubicin alone.25 Interestingly, in a study evaluating the association between aortic stiffness and anthracycline-based chemotherapy, individuals with preexisting cardiovascular disease who received statin therapy in conjunction with anthracycline chemotherapy had preserved left ventricular function compared to patients who did not receive statin therapy.26 Seicean et al reported a hazard ratio of 0.3 (P=0.03) for developing heart failure when patients with breast cancer were treated with anthracyclines and statins concurrently.27 Although these studies are promising, further studies involving larger cohorts and randomized control trials are required to confirm this response. However, in light of the possible benefits of statin therapy, initiating statin therapy in patients with breast cancer who have a moderate- or high-risk ASCVD score and who will be receiving anthracycline-based therapy may be valid. Within our facility, the Cardio-Onc clinic has a higher statin prescribing rate utilizing ATP III guidelines compared to ASCVD risk. In our study, a higher percentage of patients in the Cardio-Onc cohort had underlying cardiomyopathy compared to the Ob-Gyn cohort. This difference between groups is likely secondary to the cardiotoxic treatments the patients had received. Specifically, anthracyclines and HER2 receptor inhibitors are known to result in chemotherapy-induced cardiomyopathy, and radiation therapy is known to increase the risk of delayed atherosclerosis leading to coronary artery disease.28 We also determined that according to ASCVD risk score, only 60.9% of patients in the Ob-Gyn group and 31.0% of patients in the Cardio-Onc group had been appropriately placed on statins during the initial consult. The patients in both clinics were not appropriately managed according to ASCVD guidelines. However, according to the ATP III guidelines, both clinics had impressive statin prescribing habits, with 50.0% of high-risk patients in the Ob-Gyn group placed appropriately on statins and 53.9% of high-risk patients in the Cardio-Onc group on statins or prescribed statins at the cardiology visit. This lapse in prescribing habits in accordance with the most updated ASCVD guidelines may be attributable to numerous factors, including physician hesitation to prescribe statins for individuals undergoing chemotherapy, failure to adapt to the new lipid guidelines, failure to calculate the ASCVD risk score, or lack of comfort with statin use. Protocols need to be developed and measures need to be taken to improve statin prescribing in this high-risk cancer population to decrease the risk of atherosclerotic cardiovascular disease. Interestingly, our study did not identify a difference in the 10-year ASCVD risk score between the Cardio-Onc cohort and the control group of women without breast cancer at the Ob-Gyn clinic. This finding was unexpected, as elevated cholesterol levels have been described among individuals with breast cancer compared to their age-matched healthy peers.29,30 We saw a significant difference in the Framingham risk score between the 2 groups. These 2 risk scores are similar with 1 major difference: the ASCVD risk score includes ethnicity in its calculation and is more generous in its statin requirements as evidenced by the larger subset of our subjects who meet its statin-prescribing criteria. Limitations of this study are the single-center design, small sample size, and a possible selection bias because patients are referred to our Cardio-Onc clinic. Further research needs to be conducted at multiple centers to gain generalizability. Because patients with breast cancer may receive cardiotoxic treatments, risk stratifying these patients is imperative to optimize their health and to prevent the development of cardiomyopathy. To our knowledge, we are the first to risk stratify individuals with breast cancer based on ASCVD risk score and Framingham Risk Score. We found poor statin prescribing practices for patients in both groups according to the ACC/AHA and ATP III guidelines. Further research is required to determine alternative methods for risk stratification and to apply the ASCVD risk scores clinically. SEER stat fact sheets: female breast cancer. National Cancer Institute: Surveillance, Epidemiology, and End Results Program Web site. http://seer.cancer.gov/statfacts/html/breast.html. Published 2014. Accessed July 19, 2016.